The Funeral Mass will be held on Monday at 10 AM at St. Gabriel Catholic Church. The family will receive friends Sunday evening from 5-7 PM at Wilkerson Funeral Home. Bill was born March 22, 1924 and raised in McKeesport, PA where he was a part of a large close-knit Irish Catholic family. He was preceded in death by his wife of 49 years, Jane Braun, and their son, Mark. He was also preceded in death by his parents, William and Catherine (Dunlay) Spiegelberg, son-in-laws, Kenan Fleming and Carl Barrett, sister-in-law, Mary Hecksel, brother-in-law, John Braun, brother and sister-in-law Martin and Norma Braun. Bill served in the Navy during WWII from 1943-1946. Upon discharge he enrolled at Bowling Green University where he met Jane. While there, he earned a Masters in Biology and a Minor in Chemistry and began working for Durkee’s in Norwalk, OH. Bill and Jane moved to Jackson, MI where he started his career with the Goodyear Tire Co. After raising 9 children with numerous transfers to Danville VA, Fayetteville NC, Cumberland MD and 30 years with the company, they retired to Morehead City NC. After Jane passed away, Bill married Kay (Phillips) and spent 13 wonderful years traveling, golfing, entertaining friends and family, and raising their dogs, Birdie and Duke. 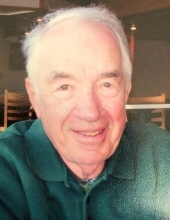 Bill loved traveling, fishing and golfing, but his passion was his family. He was a member of St. Gabriel Catholic Church in Greenville NC. He is survived by his “Original Nine”, Shawn Spiegelberg of Fort Wayne IN, Sally Barrett of Fayetteville NC, Kathy Fleming of Greenville NC, Janet (Cameron) Watkins of Lynchburg VA, Anne Hobbs of Greenville NC, Tony (Tara) Spiegelberg of Huntington WVA, John (Suzy) Spiegelberg of Fayetteville NC, Karen Davis of Portland OR, Mary (Kevin) Farley of Fayetteville NC, as well as 16 Grandchildren, 10 Great Grandchildren, Sister-in-law, Mary Lou Braun and Brother-in-law, Richard Hecksel as well as numerous nieces, nephews and cousins. In lieu of flowers, please make donations to St. Jude’s Hospital, 262 Danny Thomas Place, Memphis, TN 38105. To send flowers or a remembrance gift to the family of William Edward Spiegelberg, please visit our Tribute Store. "Email Address" would like to share the life celebration of William Edward Spiegelberg. Click on the "link" to go to share a favorite memory or leave a condolence message for the family.